Key was a close confidant of President Andrew Jackson and a member of his Kitchen Cabinet. Informal meetings often took place in Key’s expansive house on M Street (then known as Bridge Street) in Georgetown. Key served for eight years as U.S. Attorney, appointed by Jackson, in Washington, D.C. During that time he tried several important cases. That included prosecuting the first person who attempted to assassinate a U.S. President, Richard Lawrence, who tried to shoot Andrew Jackson on the Capitol steps on January 30, 1835. When Key realized Lawrence was mentally ill, he agreed with the defense—against Jackson’s wishes—that the man was insane and not responsible for his actions. The jury found Lawrence not guilty by reason of insanity and he spent the rest of his life in mental institutions. U.S. Attorney Key zealously prosecuted Reuben Crandall, a young doctor, for possessing abolitionist tracts, and a young enslaved man, Arthur Bowen, for attempted murder, two actions action that led to the first race riot in Washington, D.C., in August of 1835. 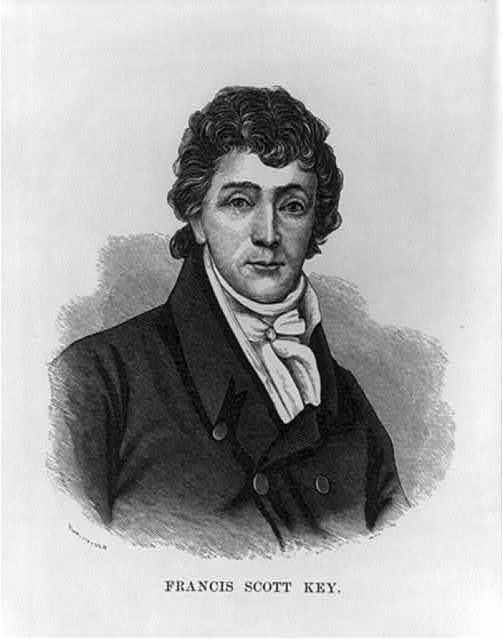 Key had a long, close friendship with John Randolph of Roanoke (1773-1833), the mercurial, brilliant, and controversial Virginia congressman. The flamboyant Randolph, who never married, was an unlikely friend of the staid father of eleven. The two men met often when Randolph was in Washington and carried on an extensive correspondence when he wasn’t. Randolph named Key an executor of his estate. In 1823, Frank Key, who had been a trustee of the Maryland General Theological Seminary since 1820, joined with several other pious Episcopalians—including Rev. William Meade—to start a seminary in Alexandria, Virginia, to prepare men for the priesthood. The Protestant Episcopal Theological Seminary—today known as the Virginia Theological Seminary—opened its doors that year with two instructors and fourteen students. Key was a strong supporter of the Seminary until his death in 1843. Employee of the Year certificate from the Camden, North Carolina Schools honoring Susan Ferguson. The Star Spangled Music Foundation is proud to cheer our Banner Moments Institute alumnus — Third Grade Language Arts and Social Studies teacher Susan Ferguson — whose extraordinary efforts to share the insights and knowledge she gained with us in Maryland with her students, colleagues, and indeed the whole Camden community in North Carolina, has resulted in her being named “Employee of the Year” for the Camden County Schools. On June 13, 2014, Third Grade Teacher Susan Ferguson from Grandy Primary in Camden, North Carolina was awarded The Employee of the Year certificate for “valued and devoted service to the children of Camden County.” This recognition is given to employees who have contributed to the community of Camden Schools in an outstanding way. Students parade their life-size replica of the Star Spangled Banner garrison flag at a Camden football game in September 2014 to celebrate the Anthem’s 200th birthday. Mrs. Ferguson, after spending a month of her own time in College Park, Maryland studying at the National Endowment for the Humanities Institute “Banner Moments,” enlisted the help of the art teacher and recreated a life sized replica of the Star-Spangled Banner flag in honor of the 200th anniversary of the National Anthem. She engaged the students at the Primary school in a week long painting project. She collaborated with the high school athletic and music department to parade the Banner onto the field at a football game, while the marching band played the National Anthem. Susan Ferguson dressed as Mary Pickersgill, who created the oversize Fort McHenry Garrison Flag seen by Key that inspired his now famous lyric. Not only that, but she created lesson plans for the entire primary school to help her fellow teachers and their students celebrate the 200th Birthday of the Anthem. Finally in a school wide assembly, she invited the high school band to perform patriotic music, enlisted a boy scout troupe to demonstrate proper flag procedures, collaborated with the music teacher to teach the students several ageless patriotic songs all while dressed in period costume as flag maker Mary Pickersgill. For outstanding contributions to the educational community and for her efforts to engage the entire community in this important celebration the Camden School Board recognized Susan Ferguson as The Employee of the Year. Thank you so very much for your tremendous work on the bicentennial of “The Star Spangled Banner.” Your website, music and videos, articles, ideas, logo, etc… and etc… were extremely beneficial as my fellow teachers and I planned lessons on the singing and significance of the anthem for our PreK-eighth grade students. Our study culminated with the entire school and staff, in addition to several parents and grandparents, all dressed in red, white and blue, waving flags, sporting SSM Day logo stickers and singing at the front flag pole on September 14 and with afternoon patriotic popsicles. Our students gained a new or renewed sense of patriotism and appreciation for our national anthem. And many parents thanked us for the celebration–which wouldn’t have happened without all of your efforts. So, Happy Star Spangled Day to you too and thanks! Two hundred years ago today, the “dawn’s early light” broke over Fort McHenry and illuminated a flag symbolizing resilience and courage. Two hundred years later, the song written by Francis Scott Key in praise of the fort’s defenders still waves over the nation, celebrating the commitment of American citizens to the day-to-day requirements of democracy. Today at 4:00 p.m. (Eastern time), the American Music Institute at the University of Michigan presents “Poets & Patriots: The 200th Birthday of “The Star-Spangled Banner”—a recital of tuneful precedents, political parodies, and musical arrangements that tell the story of Francis Scott Key’s in American life. Featuring a superstar cast of singers from U-M’s School of Music, Theatre & Dance, the recital will be led by maestro Jerry Blackstone and narrated by musicologist Mark Clague. The recital will be streamed live on the Internet here, and will be archived there and eventually released in a polished video production on our Youtube channel. The recital marks the gala opening of the U-M Library exhibit “Banner Moments: The National Anthem in American Life,” curated by Clague and librarian Jamie Vander Broek and designed by Stamps School of Art & Design student Grace Rother. The exhibit covers three rooms and features an original copy of the first sheet music imprint of “The Star-Spangled Banner” arranged by Thomas Carr. It is the most valuable sheet of printed sheet music in history—only about a dozen copies survive. The recital will end with a group performance of Key’s song around the U-M’s Diag flagpole followed by a singing of “Happy Birthday” to Key’s lyric and cupcakes provided by the U-M Library. Hope to see you there!